During a New Year's Eve celebration, a Los Angeles disc jockey receives a phone call saying that when New Year's strikes in each time zone, someone will be murdered - and she will be the last one. Agent Manners: Like what? Teach him how to shoot better? Q: What exactly happens to Agent Manners? Well what can I say, there are B-Grade Movies and there are B-Grade Movies and this definitely falls into the latter. However since it's obvious that even the makers of the film know that it's not a credible movie (take a look at the closing credits) it can be forgiven. The plot is basically a convicted psycho killer is killed. He accidentally has his genetic material mixed up with some experimental acid that get combined and then lost in the snow. 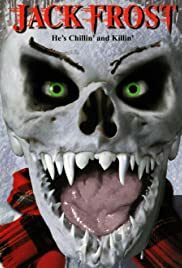 The killer now takes on the form of a snowman - if you can believe that. The snowman, Jack Frost, is after the country town Sherif who put him behind bars. In doing so, Jack Frost ends up killing half the town. This movie lacks any real scares and the effects alone remind me of the B-Grade movies of the 50's. This alone makes it worth watching for a laugh. A movie to pass the time away.